In order to study gas transport properties of fractured shale gas reservoirs for the accurate estimation of shale gas production, a new multiscale fractal transport model with an effective porosity model was proposed based on the fractal theory and the multilayer fractal Frenkel–Halsey–Hill (FHH) adsorption. 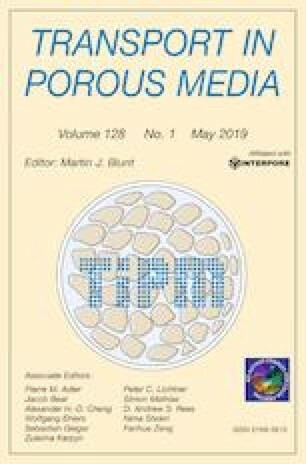 In shale matrix, both fractal microstructures of pores (such as pore size distribution, flow path tortuosity, and pore surface roughness) and multiscale flow mechanisms (including slip flow and Knudsen diffusion) were coupled. In fracture network, fractal fracture length distribution, stress compaction, and gas pressure were introduced to formulate a new fracture permeability model. These permeability and effective porosity models were then incorporated into the governing equations of gas flow and the deformation equation of reservoirs to form a numerical model. This numerical model was solved within COMSOL Multiphysics for shale gas recovery. Both transport models in shale matrix and fracture network were validated by experimental data or compared with other models. Finally, sensitivity analysis was conducted to identify key parameters to gas recovery enhancement. It was found that the multilayer gas adsorption and fractal microstructures have great impacts on gas production in shale reservoirs. The cumulative gas production can be increased by 26% after 8000 days when the multilayer adsorbed gas is considered. Larger surface fractal dimension and larger tortuosity fractal dimension represent more roughness pore surface, higher flow resistance, and lower cumulative gas production. Bigger pore diameter fractal dimension means more pores, higher permeability, and higher cumulative gas production. Our model with fractal FHH adsorption was in better agreements with field data from Marcellus and Barnett shale reservoirs than other models. The authors are grateful to the financial support from the Fundamental Research Funds for the Central Universities (Grant No. 2018ZZCX04). The parameters used in Sun’s model in Fig. 4 are listed in Table 7. The parameters used in Darabi’s model in Fig. 4 are listed in Table 8.